Registration is now open for the Halton Walk for Down Syndrome on Saturday, June 15th, 2019 at the Milton Fairgrounds from 9 AM – 2 PM. 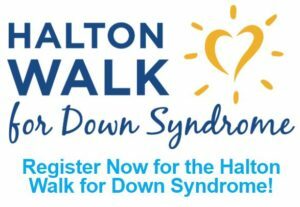 This year, we’re going with just the name “Halton Walk for Down Syndrome” to showcase Halton, and in addition to our new logo, we’re excited to unveil our new Walk website! New website – new login. We’re so glad you’ll be joining us again this year. Because this is a brand new website, every participant is new and will have to register with a new user name and password. All user names and passwords from previous Walks are no longer valid. There’s a fee this year? Yes, a small $5.00 fee for anyone 5+ who is not a VIP. Every registration provides you with a FREE t-shirt or Carnival Bracelet, which gives you access to our carnival after the Walk. If there’s a fee, should my friends and family register themselves? Yes! Parents/guardians can still register their immediate family, but there are tools once you register to “invite” your contacts to join your team so they can register, pay the registration fee, and have access to their own fundraising tools! Every participant will have an individual page, which will contribute to your team’s overall fundraising total. Why? Your personal page gives you the chance to tell your own story of why you’re walking, showcase your own photos, and invite your own family & friends to donate to you. You’ll also be able to unlock some neat achievement badges! A little friendly competition never hurt anybody, right?? And it’s all for a great cause! Don’t forget – if you want to receive a FREE t-shirt for the Walk to give you access to the Carnival, register by Friday, May 10th. This can not be extended this year and no extra t-shirts will be ordered. Visit the FAQ section of the website. A lot of common questions & answers can be found there. Contact office@haltondownsyndrome.com if you have any difficulties during the process. Happy Fundraising! Let’s reach our goal this year!